It feels good! Don’t think we’ve been nominated for anything in the past, so it feels good to be nominated together with all those great football sites. 2) What kind of year has 2010 been for FootballShirtCulture.com? 2010 has been a very colorful year for us. Lots of new products came out because of the World Cup, and we did a site update. Also, many new fantasy kit designers joined our community and uploaded their work for all of us to see. Leaks… leaks… leaks… We have to be honest about it… we’re the Wikileaks of football products.. It’s a dirty job, but someone got to do it. In all seriousness.. The key factor is probably our community of football shirt minded people, who visit and contribute to the FSC website. Many have been around for years and a big thanks goes out to them. We would vote for our friends over at Footy-boots.com. 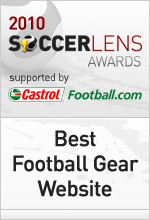 They’ve done a great job in 2010 and are definitely THE site to visit if you want to know all about the latest football boots and related products. 5) What’s next for FootballShirtCulture.com? We hope 2011 will be an even better year for us, and we have planned some new projects for next year. There will also be another site update, with even better community features. Well I just took a look at it. I was looking for Wesley Sneijder, but found him on place 174, instead of the top 5. For me he’s one of the best players in the world right now. Too bad he didn’t bring home the World Cup this year.